More than 20 years ago, there was a rage for Three Cent Nickels. During the rare coin boom from 2002 to 2008, however, hardly anyone mentioned Three Cent Nickels. Sure, many Three Cent Nickels quietly increased in value during the 2000s. 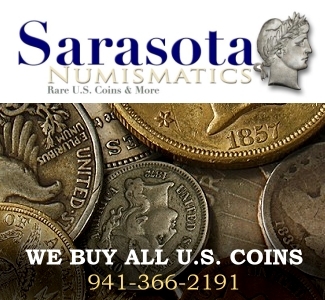 It is also true that the number of people collecting circulated Three Cent Nickels has increased markedly. Even so, it is a series that is rarely discussed and no longer receives media attention. Even when PCGS- or NGC-certified Three Cent Nickels that grade 67 or 68 become available, many people yawn. For coin buyers who are thinking about future collecting plans, are Three Cent Nickels a good choice? There is only one type of Three Cent Nickels and there are no Great Rarities in the series. Completing a set is not difficult. Collectors like to complete sets, and complete sets have a special meaning in the history of coin collecting. Nevertheless, the ease at which a set can be completed is both a positive and a negative factor. While it is great that it can be done, some collectors think that completing such a set is just too easy. No date is particularly rare. Despite the lack of extreme rarities in the series, Three Cent Nickels are a fascinating denomination and I find the obverse (front) design to be particularly attractive. There were Three Cent Nickels before there were five-cent nickels. Three Cent Nickels were minted from 1865 to 1889. Shield Nickels, which were denominated at five cents, were first minted for circulation in 1866. Joseph Wharton had a very large financial interest in the nickel industry. As the U.S. Civil War was decided in 1864 and formally came to an end in early 1865, Wharton realized that there would then be less military demand for the metal nickel and he was aiming to encourage other industries to utilize nickel. Having the U.S. Mint feature nickel in coinage was a ‘dream come true’ for Wharton. Undoubtedly, Joseph Wharton was disappointed by the decision to drop nickel from the composition of small cents, which were 12% nickel from 1856 to 1864. Three Cent Nickels and five cent nickels consisted of 25% nickel and tend to look like they are composed of a much higher percentage of nickel, due to the way nickel dominates copper in copper-nickel alloys. “Until March 1865,” Walter Breen wrote in his comprehensive encyclopedia, “Wharton’s supporters” placed “unceasing pressure on Rep. John Adam Kasson (R.- Iowa), their chief opponent, finally convincing him that anything, even Wharton’s latest proposal for coins of 25% nickel, would be better than further” use of three cent fractional currency notes, which were very small, unpopular items of paper money (See Breen’s Encyclopedia of U.S. and Colonial Coins, 1988, p. 242). I acknowledge that most collectors now are not concerned about Joseph Wharton. Few know that he was responsible for the founding of the Wharton School of Business at the University of Pennsylvania. Although I find the history of Three Cent Nickels to be very curious, collectors think more about nickels as objects. In regards to collecting Three Cent Nickels, buyers usually choose one of three grade ranges. Three Cent Nickels that grade less than 55 are not expensive, except for issues in which few (if any) business strikes were produced. Additionally, some collectors focus on coins in the 55 to 64 grade range, ‘Choice’ AU, uncirculated or Proof coins. Collectors who focus on ‘gems’ buy only coins that grade 65 or higher. Three Cent Nickels of all dates are available in 65 and higher grades. First, I discuss circulated Three Cent Nickels, as most coin collectors can easily afford to buy a few of these. Many thousands of people collect Three Cent Nickels that grade below 55. Lower prices are not the only reason why some collectors prefer circulated Three Cent Nickels. Some collectors are attracted to circulated coins because these were actually used in commerce. Proof Three Cent Nickels were sold, by the U.S. Mint, directly to collectors and to non-collectors who bought them for a variety of reasons. Moreover, business strikes Three Cent Nickels that are currently of gem quality now were not spent or abused in more than 120 years. Undoubtedly, many gem quality business strikes were obtained by collectors or by coin dealers very soon after these were minted. Three Cent Nickels that circulated have very different histories. A set of Three Cent Nickels in Good condition, would cost around $1,800, according to NGCcoin.com. A set in Good condition is usually defined such that it does not include the so called “Proof-only” dates of 1877, 1878, 1886 and 1887/6. Some coins of these four dates did, however, circulate, though it would be especially rare to find them in Good to Fine grades. Plus, some Three Cent Nickels of two or more “Proof-only” dates are not very convincing Proofs. In any event, collectors who seek Three Cent Nickels in Good to Fine grades should ignore the 1877, 1878, 1886 and 1887/6 issues. For Three Cent Nickels minted before 1877, coins in Good-04 grade could be obtained for amounts from $14 to $20. In this same date range, Three Cent Nickels that grade Fine-12 probably retail for prices from $18 to $30. I believe that Extremely Fine-40 grade Three Cent Nickels dating from 1865 to 1876 are excellent values at market prices of $40 to $50 or so, provided that coins with natural toning are selected. It makes sense to be careful about collecting Three Cent Nickels with extensive U.S. Mint caused imperfections, including excessive clash marks, very weak strikes, or substantial problems relating to the prepared blanks (planchets) on which the designs were stuck. Neat, circulated Three Cent Nickels, with few imperfections, are available. 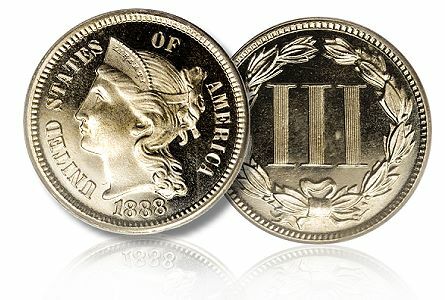 John Albanese suggests that “Three Cent Nickels in Very Fine and Extremely Fine grade are good values for collectors.” Generally, as John points out, “for many 19th-century [series], coins in Good and Very Good grades have gone up a lot in value over the last five years or so. During the same time period, Very Fine and Extremely grade coins of the same types have not gone up at all or have lagged … So, the difference in price between a Very Fine grade Three Cent Nickel and a Very Good coin of the same date is “not that much, while there is a big difference in detail and overall quality,”. As already mentioned, Three Cent Nickels dating 1877 and 1878 are typically regarded as “Proof-only” issues. Quite a few of these, however, are characterized by noticeable wear. According to Numismedia.com, a ’40’ grade 1878 is worth $506. 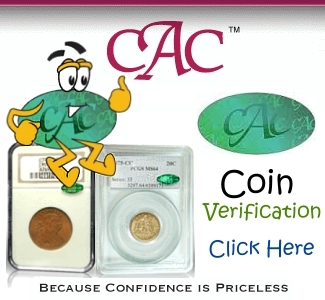 In November 2010, Stack’s auctioned a PCGS-certified Proof-65 1878, with a CAC sticker, for $862.50. It is likely that a collector should be able to obtain an 1878 which grades from 40 to 63 for a price in the $450 to $650 range. Likewise, a 55 grade 1877 in the price range of its Numismedia.com value of $1,230 may be a reasonable and sensible acquisition. In September 2005, an NGC-graded ’58’ 1877 was auctioned by Heritage for $1,380. Circulated Three Cent Nickels in the 1882 to 1887 date range are much scarcer than those struck from 1865 to 1876. During the mid-1880s, there was little demand for Three Cent Nickels among merchants and the general public. An 1882 may cost more than $100 in Good-04 grade and an 1885 may be priced as high as $500 in Good grades. Even an 1887 Three Cent Nickel, which is not really rare, is usually valued at above $235 in Good-04 grade. For some Three Cent Nickels in the 1882 to 1887 date range, Proofs are less expensive than business strikes. A Proof-60 to -62 1885 certainly could be acquired for less than $250, perhaps less than half the price of an 1885 in Very Good-08 grade. I suggest that, for each date where a business strike Three Cent Nickels is priced higher than a Proof of the same or higher numerical grade, collectors should buy the corresponding Proof Three Cent Nickel. This same advice applies to Shield Nickels as well. There is more than one reason to mix Proofs and business strikes in the same sets. First, before 1980, it was the rule for great collections to include mixtures of Proofs and business strikes. When Louis Eliasberg or Emily May Holden Norweb acquired a Proof of a coin issue, a business strike of the same type and date was usually not acquired or, at least, not deemed necessary. Eliasberg, Mrs. Norweb, and many others who assembled phenomenal collections incorporated Proofs and business strikes in the same sets, and regarded a Proof as a superior alternative to a business strike. Indeed, from the 1860s to the 1970s, the standard practice among collectors of coins that lacked wear, 60 or higher grade in current terminology, was to include business strikes and Proofs in the same sets. The acquisition of a Proof would negate the need for the presence in a collection of a business strike of the same type, date and mint location. In regard to a substantial number of Three Cent Nickels and Shield Nickels, of several dates, there is not a consensus in the coin collecting community regarding the distinction between Proofs and business strikes. Of course, most nickels are definitely business strikes and many nickels are definitely Proofs. There are a shocking number of 19th century nickels, however, for which there are differences of opinion among influential experts regarding their respective Proof or business strike status. In regards to 1878 Shield Nickels, “It is interesting to debate whether pieces should be called Proofs because they were called that by the Mint,” Q. David Bowers wonders, “or whether they should be called Uncirculated for they appear to be” business strikes (Guide Book of Shield and Liberty Head Nickels (2006), p. 116). Bowers adds that 1880 business strike “Mint State” Shield Nickels “closely parallel Proofs in appearance and are easily confused, even by professional graders.” QDB goes on to discuss complex criteria that relate to determining whether specific 1880 Shield Nickels are Proofs or business strikes. QDB makes clear that there is much disagreement among experts. I am aware of more than one instance where the graders at one of the two major grading services were in unanimous agreement that a specific Three Cent Nickel is a business strike and then were over-ruled by someone at a higher level, at the same grading service, who insisted that the Three Cent Nickel in question must be certified as a Proof, because similar coins had been certified as Proofs in the past. In countless instances, grading experts argue with each other over whether particular nickels are Proofs or business strikes. Nickels that were previously certified as Proofs have, in many instances, been later certified as business strikes, or vice versa. Suppose that a mid- to late 19th-century coin is characterized by two or more of the following characteristics: a few mushy design details, rich mint luster, noticeable Mint caused surface imperfections, weakly reflective or non-reflective surfaces, and/or is in relatively low relief in most respects. It is thus probably not a Proof, even if it is of a so called ‘Proof-only’ date. There are coins of so called ‘Proof-only’ dates and other dates that are certified as Proofs, which meet few of the criteria for a Proof. It does not make sense to rely upon the data published by the grading services as such data relates to the relative scarcity of Proofs and business strikes of some nickel issues. As most career coin dealers are confused by the differences between Proof and business strike 19th-century coins, few collectors will be able to make sound determinations in complex or borderline cases. For emphasis, I wish to restate my point in this passage. When a certified 19th-century Proof nickel, Three Cent or five cents, costs less than a certified business strike of the same type, date and grade from the same service, it makes logical sense for a collector to purchase a certified Proof. For 19th-century nickels that cost more than $150 each, collectors should only buy coins that have been certified by the PCGS or the NGC. It is common for raw coins to be deliberately misrepresented or be coins that were previously judged to be un-gradable by experts at the PCGS or the NGC. Frequently, nickels that cost less than $150 each can be found in PCGS or NGC holders as well. Many of these were submitted to the PCGS or the NGC at times when they were worth considerably more than their current respective values. Certification fees were thus then a lower percentage of the market values of these same nickels. Prices for many Three Cent Nickels and Shield Nickels are lower now than prices were in the late 1980s or early ’90s. Many collectors contend that coins in the 55 to 64 range are excellent values and tend to focus on Three Cent Nickels in this grade range. These are usually less costly than those that grade 65 or higher. In AU-55 grade, Three Cent Nickels dating from 1865 to 1876, and 1881s, could be priced anywhere from $50 to $100, depending upon the specific date and characteristics of the individual coin. Three Cent Nickels of the same respective dates that are certified as grading MS-65 would cost from $500 to $1,500 each. According to Numismedia.com, a business strike AU-55 1883 Three Cent Nickel is worth $570, while a “Proof” -55 1883 is worth $210. As I explained already, this is a case where it may make more sense for a collector to buy an 1883 in ’55’ grade that is designated as being a Proof. Even if the certified Proof-55 1883 is definitely a true Proof, an attractive Proof-55 1883 is a better value, in my view, than an attractive AU-55 business strike 1883. In regards to 1883, 1884 and 1885 Three Cent Nickels that grade 63 and 64, coins that are certified as business strikes (“MS”) are much more expensive, generally four to 10 times as much, as those that are certified as Proofs. In this context, I suggest that collectors acquire certified Proof-64 Three Cent Nickels. Consider a PCGS- or NGC-certified MS-64 1885 Three Cent Nickel. It is valued at $5,000 to $7,500 in MS-64 grade, while a PCGS- or NGC-certified Proof-64 is valued at less than $700. In August 2010 in Boston, Heritage auctioned a PCGS-certified MS-64 1885 for $6,900. In November 2010, Stack’s sold a PCGS-certified Proof-64 1885, with a CAC sticker, for $402.50. I strongly suggest that a certified Proof-64 1885 is a better value than a corresponding certified MS-64 business strike. As for 1877 and 1878 Three Cent Nickels, I suggest that these be considered by all collectors building sets of Three Cent Nickels. Yes, I realize that most 1877 and 1878 Three Cent Nickels did not circulate. Even so, 1877 and 1878 Three Cent Nickels that grade from 50 to 58 are around and are not extremely expensive. In sum, a set of Three Cent Nickels that grades from 55 to 64 is a good value for collectors. Consider that all the dates from 1865 to 1876 and from 1879 to 1882, in AU-55 grade, would total around $1,800, $2,100 at most. Adding an 1888 and an 1889, also in AU-55 grade, would probably amount to another $400 or so. As for the 1883, 1884, 1885, 1886, 1887, and 1887/6 dates, these are very expensive or unobtainable in certified AU-55 grade. If PCGS- or NGC-certified Proof-61 or -62, however, all six of these may be acquired for an average of less than $325 each, perhaps $2000 for all six. A 55 or higher grade 1878 could probably be purchased for less than $600. Certainly, a PCGS- or NGC-certified 1877, of 55 or higher grade, could be found for less than $1,700. A truly complete set of Three Cent Nickels in 55 or higher grade could thus be assembled for less than $6,800. If such a project was completed over a period of four years, the average annual expenditure would be $1,700 per year. I realize that this is a significant amount for most people. In the realm of scarce and rare U.S. coins, though, $1,700 is not a huge amount. Besides, completing a whole set of a 19th-century U.S. coin series, in 55 or higher grade, for $6,800 seems reasonable, from a logical perspective. Plus, Three Cent Nickels are a one-type denomination. 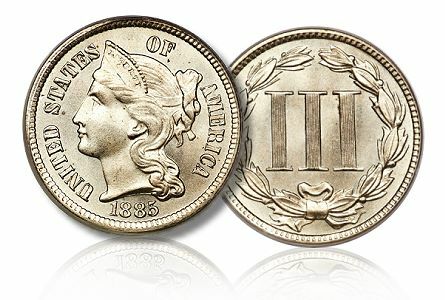 While Three Cent Silvers have the same face value, these are considered to be a different denomination, as Three Cent Silvers are a different kind of coin. Therefore, a collection of a whole denomination, in 55 or higher grade, could be completed for $6,800! By tradition, coins that grade 65 or higher are termed gems, such as ‘Gem BU’ and ‘Gem Proof’! So, collectors who wish for gems buy Three Cent Nickels that grade 65 or higher. As Three Cent Nickels are graded a little more liberally than most other 19th-century series, I maintain that collectors who wish for true gems tend towards Three Cent Nickels that grade 66 or higher. In my view, there is a considerable difference in quality between a typical mid-range 65 grade and a typical mid-range 66 grade Three Cent Nickel. John Albanese figures that “Gem Proof Three Cent Nickels are bargains compared to what they used to be in 1980 or 1990. In late 1978, you could buy Gem Proof Three Cent Nickels for $175.” At a major coin show in February 1980, “Gem Proofs, sixes or sevens by today’s standards, were selling for $3,500 each,” Albanese exclaims. In April 1980, prices for these were “cut in half practically overnight.” John adds that prices fell further over the following two years. Demand for Gem Proof Three Cent Nickels sharply increased in 1989 and increased to an even greater extent in early 1990. Prices for Gem Proof Three Cent Nickels are lower now than such prices were in early 1990. In my column of Feb. 23rd, Albanese revealed that “there has been very little grade-inflation” regarding Proof Three Cent Nickels. Usually, “Three Cent Nickels that graded 66 or 67 in 1990 are graded the same now,” according to John. Albanese was the sole founder of the NGC in 1987 and he started the CAC in 2007. Prices for many gem business strike Three Cent Nickels are also lower now than these prices were in 1990. While 66 and 67 grade business strike Three Cent Nickels are not as exciting, in my view, as many of the Proofs, such business strikes are interesting and often very attractive. Even so, I find that some of them are controversially graded. Collectors who buy MS-66 and -67 Three Cent Nickels should seek advice from leading experts and/or learn how to grade by examining a large number of them while asking questions of grading experts. For those who can afford to do so, the completing of a set of gem business strikes, Gem Proofs, or a mix of Gem Proofs and business strikes, is likely to be a fulfilling endeavor. Such sets are often captivating. Buyers who are unable or unwilling to build sets of Three Cent Nickels can enjoy them as type coins. A Good grade, problem free, naturally toned Three Cent Nickel can easily be found for less than $20. One in Very Fine Grade would not cost much more. John Albanese reports that PCGS- or NGC-certified Proof-66 Three Cent Nickels, of the least scarce dates “wholesale for around $700.” It would, in my view, be fair for a retail dealer to offer a nice one for $800 to $900. “I get $50 more for Proof-66 Cameo Three Cent Nickels,” Albanese reveals. A ‘cameo’ designation refers to a contrast of white design elements (devices) against relatively dark fields. This contrast is often exaggerated by dipping a coin in an acidic solution. “The Cameo designation is sometimes just a sales tool. It is psychological,” Albanese relates. “Maybe pay a little premium for a cameo designation if you like the coin. If a non-cameo Proof has smooth surfaces and pretty original colors, it might be more desirable than one with a cameo [contrast]. Don’t always pay a premium for a cameo. There always are other attributes [to consider]. I would rather have an original non-cameo with pretty colors than a dipped cameo,” Albanese asserts. I agree with John. Further, I would recommend naturally toned Three Cent Nickels that show little or no evidence of ever having been dipped. In my view, the premiums that are frequently paid for “Deep Cameo” or “Ultra Cameo” coins are illogical and are not consistent with the traditions of coin collecting in the U.S. Besides, a large part of the ‘Deep Cameo’ contrast, when found on 19th century coins, is often (though not always) due to acidic dipping solutions. In conclusion, whether a collector has $50 to spend or $50,000, he or she can appreciate Three Cent Nickels in actuality. Naturally toned, attractive Three Cent Nickels of most dates in many grades are not hard to find. Besides, these are cute and are conversation pieces. In everyday life, I find that many people are intrigued when informed that there were Three Cent Nickels before there were five-cent nickels.